This story has gone viral for an INSPIRING reason. Being a college student and barely having enough money to provide for school fees are common scenarios for college students today. That’s why most of the students look for a part time job, which I believe is an amazing start for them to live independently since they’ll be able to learn things which they could not learn inside the school campus. Just like Samuel Nzube, a foreign student from Nigeria who is a student from one of Michigan’s prestigious schools. 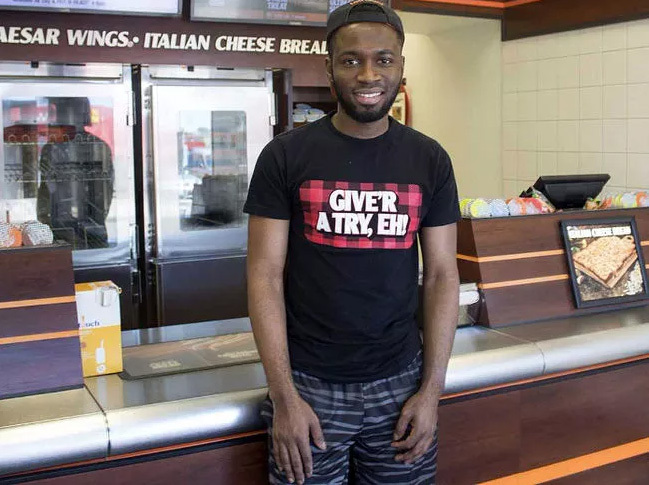 It’s been five years since 22-year-old Samuel Nzube, an Algoma University student in Sault Ste. Marie, Michigan, has not been home to see his family in Nigeria. But that’s all about to change thanks to the kindness of his coworkers at Little Caesars. Nzube’s work friends reached their goal of $2,000 by saving up their tip money since last October. The amount should be sufficient to fly him home to see his family. If it’s not, their employer said he will pay the difference. “I was speechless,” Nzube told The Sault Star. “He’s so happy and didn’t say anything for like five minutes,” Matthew Fragomeni said, recalling his friend’s reaction upon learning that he’d be going home.